Peatlands, made of partially decomposed plants, store tremendous amounts of carbon. That’s Christopher Briggs, the Secretary General of the Convention on Wetlands – an intergovernmental treaty also known as Ramsar. As peatlands around the world are drained, degraded, or burned – often for development or agriculture – they release massive amounts of heat-trapping carbon back into the atmosphere. But Briggs says there’s hope. Thanks to the Ramsar Treaty, governments are now adding their peatlands to a list of “Wetlands of International Importance.” This status can help protect and even restore them for years to come. … which can help limit carbon pollution and global warming. 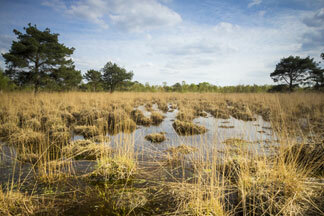 Photo: Wetlands with decayed vegetation known as peat moss or sphagnum (copyright protected).